Robert J. Zehr, MD is a board-certified, fellowship-trained orthopaedic surgeon and the founder of The Zehr Center for Orthopaedics, a private orthopaedic surgery practice located in Naples, Florida. He specializes in hip and knee replacement surgery, complex revision joint surgery, knee arthroscopy and trauma reconstruction. Dr. Zehr has over 30 years of orthopaedic surgical experience in complex joint reconstruction and rehabilitation, having been in both the academic environment of the Cleveland Clinic for over 20 years and private practice for the past 10 years. Prior to being sent to Southwest Florida in 1998 to help develop the Cleveland Clinic Naples, Dr. Zehr was the Head of Orthopaedic Oncology for The Cleveland Clinic Foundation where he came on staff after a prestigious fellowship in orthopaedic oncology at the University of Florida and his residency training at The Cleveland Clinic Foundation. Dr. Zehr achieved further career success while an attending physician at the Cleveland Clinic Naples, where he distinguished himself as its Executive Director, Chief of Staff and Head of Orthopaedic Surgery, while maintaining a full and thriving surgical practice. With the abrupt departure of the Cleveland Clinic from the Naples, Florida area, but still wanting to practice in the Southwest Florida community where he had practiced since 1998, Dr. Zehr began his new venture into solo orthopaedic practice in late 2007. His highly successful joint replacement practice has positioned him as a high volume hip and knee replacement surgeon in Southwest Florida and the leader in outpatient joint replacement surgery through Seaside Surgery Center. In addition to his private practice and surgery center, Dr. Zehr has been named Chief of Surgery for Landmark Hospital of Southwest Florida and Medical Director of The Joint Care Center at Landmark. 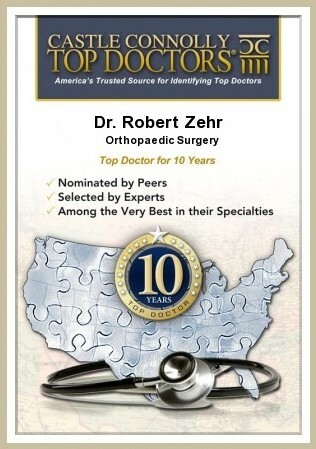 In the tradition of superior care and innovation, Robert J. Zehr, MD was recognized by one of the most distinguished physician rating services in the country, Best Doctors, Inc to be included once again in the Best Orthopedic Doctors in America database, an honor he has received every year since 1998. This annual list is compiled from surveys of physicians asking them who they would go to for treatment in their specialty. The result is a proprietary database of more than 53,000 medical experts in over 450 specialties and subspecialties worldwide. An exhaustive peer-review survey by thousands of doctors determines the physicians in this database. Only those who earn the consensus support of their peers are included. Doctors cannot buy listings. For this reason, inclusion in the Best Doctors in America database is a remarkable honor. Castle-Connolly Medical, Ltd – publishers of Americas Top Doctors – has recognized Dr. Zehr as one of the top treating orthopaedic surgeons in Southwest Florida each year since 2002 Castle-Connolly considers the following criteria to determine a doctor’s eligibility for inclusion in America’s Top Doctors: professional qualifications such as education, residency, board certification, fellowships; professional reputation; hospital appointment; medical school faculty appointment; experience; and disciplinary history. Every month, more than 200,000 patients across the U.S. provide online feedback about their doctor experiences. They rate the various components of the care they receive, such as bedside manner, doctor-patient time, follow-up care, ease of appointment setting, courtesy of office staff, and they also share their overall opinions. 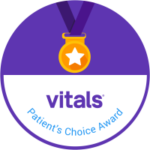 From this data the very top scoring physicians are chosen for the “Patients’ Choice Award.” Over the course of each year, hundreds of thousands of patient reviews are written and shared. While physicians generally receive positive feedback from their patients, only a select few consistently receive rave reviews. Of those with high praise, only physicians with near-perfect scores receive this honor. In fact, of the nation’s 870,000 active physicians, only 5% are accorded this honor by their patients; only 1% have achieved five consecutive awards. 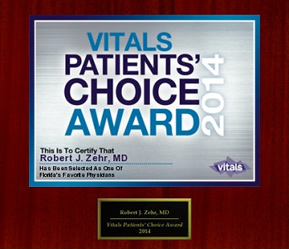 Dr. Zehr has been chosen by his patients for this award every year since 2009. In addition to the Patients’ Choice Award, Dr. Zehr consistently earns accolades as one of “America’s Most Compassionate Doctors.” Fewer than 3% of the nation’s 870,000 active physicians are accorded this honor by their patients. This is truly a people’s choice award. In Southwest Florida, Gulfshore Life Magazine has honored Dr. Zehr as one of a select few best orthopedic surgeons in its annual “Top Doctors” awards each year since 2002. 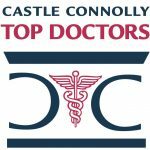 Gulfshore Life Magazine partners with Castle Connolly Medical in New York to develop a list of the top-tier doctors in each specialty that is, those physicians most highly recommended in Collier, Lee and Charlotte counties each year. In addition, Dr. Zehr instituted the highly acclaimed Cleveland Clinic Naples “Joint Club” which cohesively coordinated the many individual talents of hospital nursing, physical therapy, case management and surgery with outpatient pre-operative treatment, bringing them into a well orchestrated and seamless educational experience. This team effort let the patient focus exclusively on returning to life’s activities after joint replacement surgery. The Orthopaedic Center of Excellence was a “Premier Site” for this system of patient care and was visited by national and international dignitaries and surgeons desiring to improve their patient care and management. His extensive experience as leader, researcher and surgeon keeps Dr. Zehr in high demand as a speaker locally, nationally and internationally. He has spoken, operated or taught in Germany, Italy, Canada and Great Britain. He has written extensively on skeletal reconstruction, but enjoys educating individual patients on their specific orthopaedic problems. 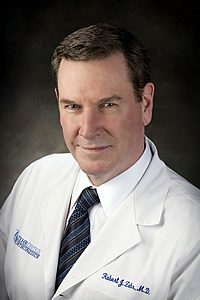 He is a Fellow of the American Academy of Orthopaedic Surgeons, a Diplomate of the American Board of Orthopaedic Surgeons, a member in good standing in the American Association of Hip and Knee Surgeons and the Florida Orthopaedic Society, the Florida Medical Society and the Collier County Medical Society. See Dr. Zehr’s curriculum vitae for more information on his professional experience and education.